4NG is a proven innovator of energy and infrastructure management for data centre’s of all sizes and SMARTset is helping to change the way in which data centre managers understand their infrastructure. SMARTset provides one connected intelligent view of data centre’s and is completely flexible and customisable working with existing hardware and software. SMARTset provides IT and Facility managers with the control they need to increase power management efficiency, improve data centre productivity, and enhance operations. 4NG work with facilities management professionals and data centre and IT managers to lower energy and cooling costs and improve their understanding and management of their infrastructure. We deliver breakthrough energy savings, underpinned by granular insight for network operators. 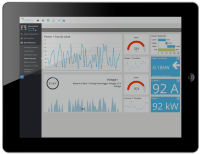 Our core SMARTset software is a customisable, web based, BMS and IOT solution. Our unique patented free air cooling products are ideal for deployment in small and medium rooms. Formed in 2005, 4NG operates in the UK, EMEA, India and China. Headquartered in Nottingham, UK, the company has installed hardware and software solutions in over 15,000 sites in utility networks worldwide.